Explanation: This rock structure is not only surreal -- it's real. The reason it's not more famous is that it is, perhaps, smaller than one might guess: the capstone rock overhangs only a few meters. Even so, the King of Wings outcrop, located in New Mexico, USA, is a fascinating example of an unusual type of rock structure called a hoodoo. Hoodoos may form when a layer of hard rock overlays a layer of eroding softer rock. 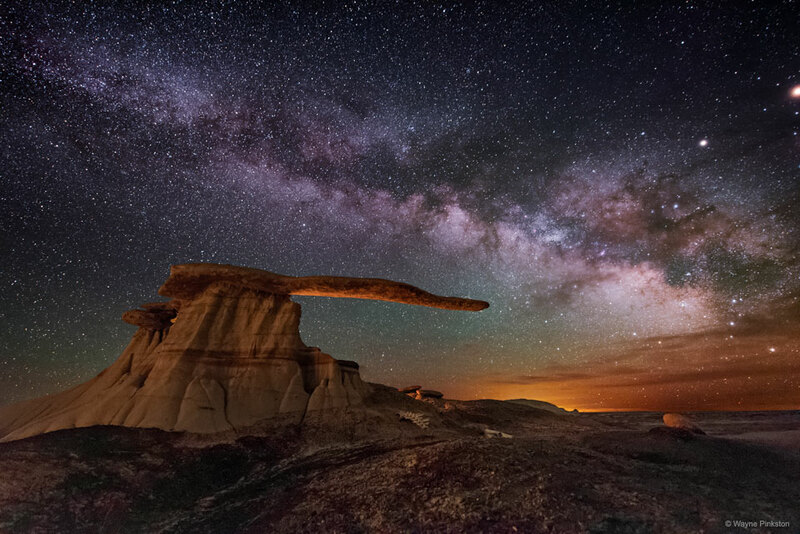 Figuring out the details of incorporating this hoodoo into a night-sky photoshoot took over a year. Besides waiting for a suitably picturesque night behind a sky with few clouds, the foreground had to be artificially lit just right relative to the natural glow of the background. After much planning and waiting, the final shot, featured here, was taken in May 2016. Mimicking the horizontal bar, the background sky features the band of our Milky Way Galaxy stretching overhead.